The forecast for this week looks beautiful! Lots of sunshine and temperatures at high around 60 degrees! 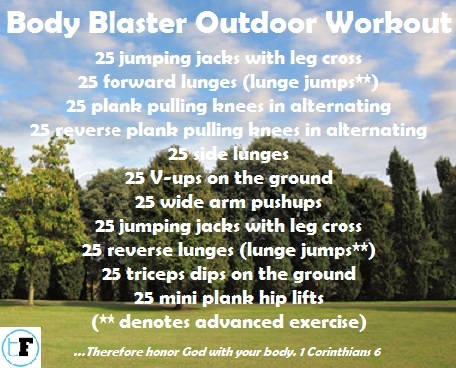 If you are crunched for time this week and want to get in a quick full body workout, and enjoy this awesome weather, try this Full Body Blaster Outdoor Workout below! Outdoor exercise doesn't have to be reserved for running - get out in the yard and power through this great workout! This weekend was full of fun, active, outdoor activities for all ages! Saturday morning, many families came out (despite less than perfect weather) to the Omni Dawg Crawl so their children could participate in a fantastic obstacle course! Sunday morning was the 4th annual AthHalf! Over 3000 runners ran this years half marathon through our beautiful city. Congratulations to all who participated in this fun event! So proud of hard working clients Cress Johnson, Valerie Langley, Meg Parker, Emily Kleiber, Laura Moore, Lacy Sinkwich and Tori Peirce who ran the race this year! And good luck to Bonnie Chambers and Cindy Clark who are walking 13 miles for Breast Cancer Awareness this Saturday! Looking forward to training for our next race... who is in ? I would love to develop a training plan for your future race! Mile 6: I can do everything through Christ, who gives me strength... & Mile 10: Commit your actions to the Lord, and your plans will succeed. (Proverbs 16:3). What gets YOU through your most difficult moments?